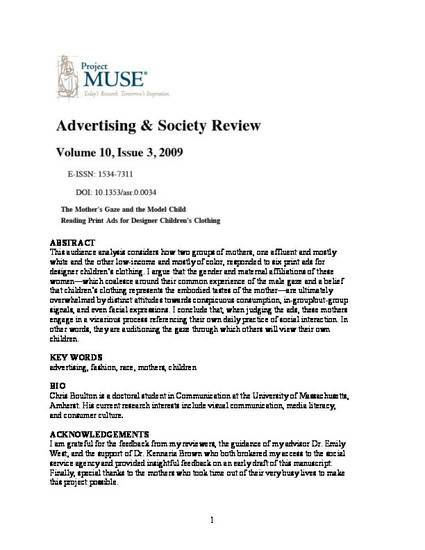 This audience analysis considers how two groups of mothers, one affluent and mostly white and the other low-income and mostly of color, responded to six print ads for designer children’s clothing. I argue that the gender and maternal affiliations of these women—which coalesce around their common experience of the male gaze and a belief that children’s clothing represents the embodied tastes of the mother—are ultimately overwhelmed by distinct attitudes towards conspicuous consumption, in-group/out-group signals, and even facial expressions. I conclude that, when judging the ads, these mothers engage in a vicarious process referencing their own daily practice of social interaction. In other words, they are auditioning the gaze through which others will view their own children.